I’ve been wearing glasses since I was in the seventh grade. I’ll be turning 32 in a month, so that’s basically the last twenty years of my life. I definitely take my frame purchases seriously. After all, those of us who wear glasses have them on our faces most of the day, every single day. They become a part of our personalities as much as they are a necessity to carry on the day’s tasks with clear vision. 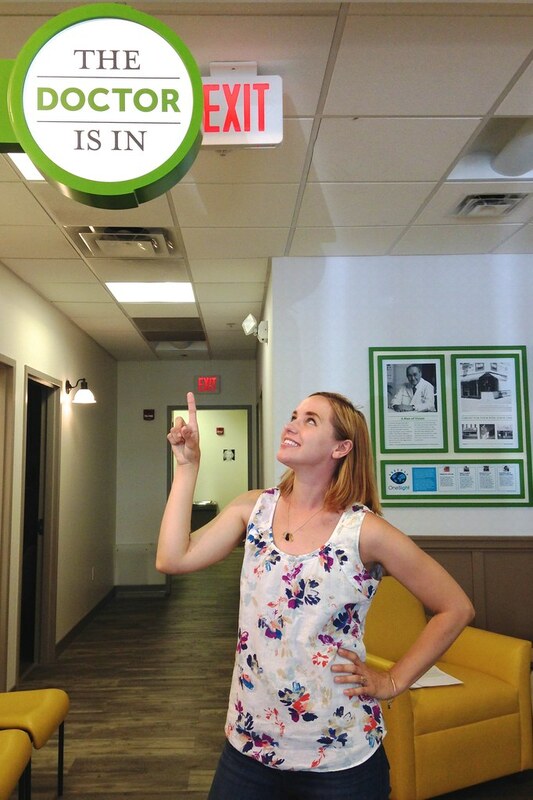 BlogHer recently offered me the opportunity to visit the newly renovated Pearle Vision EyeCare Center at The Shoppes at Wyomissing in Wyomissing, PA. And it was extremely good timing. I was actually due for my annual eye exam last week, so I jumped on the chance to check out location, its service, and all those pretty frames. 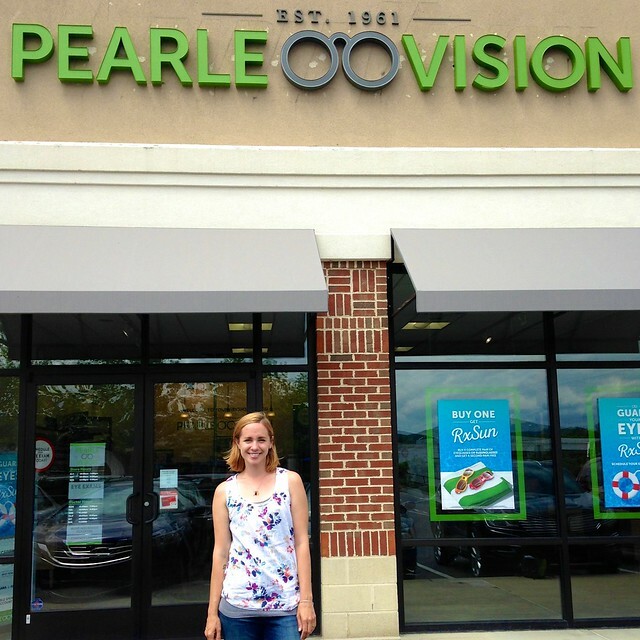 My last experience with Pearle Vision was way back in the 1990s (for my first eye exam! ), so I was more than delighted to see such modern, bright interior decor. The walls were painted their signature green with warm wood accents. The lighting wasn’t at all harsh. In fact, there was nothing sterile about this shop. It felt -- instead -- like a neighborhood boutique. The glasses were all arranged on clear shelving around the walls. Lots of great brands from which to choose as well! Prada, Ray-Ban, Coach, DKNY, Versace, and Tory Burch, just to name a few. My wait to see Dr. Sider was short, but in the time I had browsed, I already had my eye on one particular pair. So, I set it down with the woman at the front desk and went into the exam room. What I noticed first about this exam was how in-depth the doctor went with me into my eye history. He asked about my allergies, my work on computers, my health history, and fielded all sorts of other questions and concerns I had. I slipped out of my contacts and we go right into the exam. 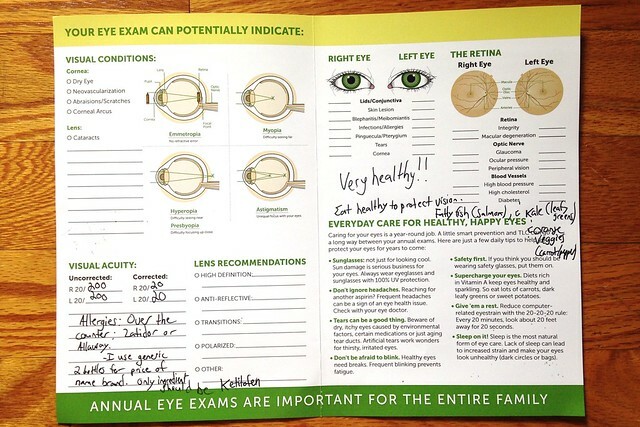 After a series of reading letters from the chart and determining which prescription fit me best, I was happy to hear my eyesight hasn’t changed since last year or the two years prior. Though it’s stayed the same for a while, I think it’s still important to keep up with regular annual visits. Before I left, Dr. Sider handed me this helpful sheet with some tips and suggestions. Did you know that eating healthy foods can help protect your vision? I spent the rest of my visit finalizing my frames choice and finishing up. The staff was really helpful with my glasses search, offering several options that might meet my preferences. I love the plastic-type frames versus wire, and they had so many styles and colors. I ended up choosing these really cool blue/green tortoise frames by RIMS. I can’t wait to get them! I was very pleased with my customer service experience at Pearle Vision, as well as the frames selection, and I definitely see myself returning to the Pearle Vision EyeCare Center in the future. Pearle Vision accepts most major insurances and my location even offered a AAA discount on the exam and frames. Check their website from time to time to find out about any specials that are going on. For example, when I had my visit, they were offering a BOGO deal (prescription glasses and/or sunglasses) that was one of their best of the year. Pearle Vision was opened back in 1961 by Dr. Stanley Pearle. Today there are close to 600 EyeCare Centers across the United States -- likely one in your neighborhood. For more information, follow Pearle Vision on Facebook and YouTube. Are you going to visit your local Pearle Vision EyeCare Center? Tell me in the comments and you will be entered to win a $100 Visa gift card! This sweepstakes runs from 7/7/15 – 10/3/15.